This exotic sauce can be mixed with yogurt or sour cream for a dip, added to pasta, or used as a marinade! Bring the flavors of Northern Africa to your dining table! We tried this with a cous cous dish and had a little extra, so we made marinated grilled chicken. Yummy! Mince or shred garlic cloves. Add the cumin, coriander, and the ground chilies with a couple of pinches of salt to a food processor. Grind until fine. Saute the garlic with a tbsp. of olive oil. Heat until garlic is golden. Add the spices and the rest of the salt and cook for a couple of minutes. Remove the sauce from heat. let it cool down a bit. You will only need a tbsp. or two of the sauce per recipe. 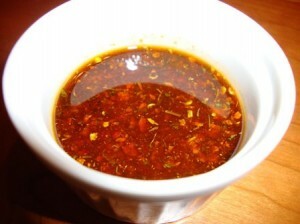 Dilute with more oil, yogurt or cream to make a sauce, leave alone for a rub/marinade.